Rain was predicted for yesterday. I knew this. But it sounded like the possibility for rain would lessen as the afternoon wore on, so I headed out to market in lightening skies. The sun came out as I was setting up, and it started getting hot. Time came for market to end, and the clouds began rolling in again, dark and from the west. I packed as hard as ever I could and got most of it in bins before the skies opened up again. But it rained hard and the tent and I were thoroughly soaked again. Such is the life of the market vendor! But I've not had it as bad as the vendor next door to me has...the last 6 markets she's been at have been rained on. Ouch! 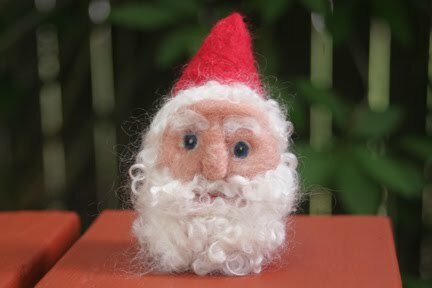 and a Santa gnome, first one of the season. 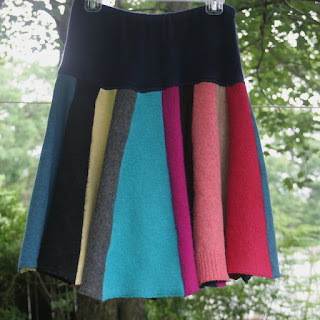 I especially love the colors in the first skirt. Can I suggest that you find out where that other vendor will be, so you know which shows to avoid? Sounds like she has a little rain cloud parked over her head! Thanks! I love how vibrant the colors are, too. Unfortunately, I share many markets with the rainy vendor! It's been better this week.